It is a sunny day in Barkerville, and a welcome mountain breeze keeps the air cool and fresh. Last week there were a few roasting hot days so today our cast of interpreters, merchants and visitors alike are enjoying the ease of this temperate moment. Everyone I meet on the street is experiencing a similar sensation – we are all gently meandering through a soft cloud of good cheer. My first interpretive offering of the day, a “Characters of the Cariboo” performance in the Kelly Saloon, is done. The other street interpreters are off playing croquet with vacationers and engaging in street scenes. I realize I have about a half-hour of free time before my next show. When we are not scheduled to do a specific scene or tour or site-specific performance in Barkerville, we interpreters are usually hosting. “Hosting” is the term we use to describe in-character, improvised interaction with visitors. Now, as I gaze up and down Barkerville’s main street, I realize that most of our guests are off at the Waterwheel Show or the Theatre Royal and at this very moment there aren’t many folks around that I can “host” to. So, instead, I choose to spend my time engaging in one of my favourite Barkerville pastimes: I go exploring. I have been professionally associated with Barkerville for twenty-one years, so you might think that by now I have memorized every nook and cranny of the place. The thing is Barkerville is always changing. Descriptors like “heritage site” and “museum” often conjure misleading ideas: ideas of static displays and dusty sameness. This is simply not true. Barkerville Historic Town, like many modern museums, is not frozen in time. Barkerville is a living, breathing entity. For all of its comforting consistency, the town is also rife with dynamic movement and exciting change. Whenever I have a few minutes to myself onsite I try to explore the less obvious – but still vital – features of Barkerville. I love, for example, finding different vantage points from which to look at the rooftops. Did you ever notice that the peaks and angles of Barkerville’s shingled and tin roofs make a gorgeous mosaic; a patchwork quilt of antique wood and metal that can look like accidental sculpture? Have you ever been out on the street just after a rainstorm as the rooftops steam like big boiling pots of broth when the water evaporates in the warmth of the sun? If you peek into the narrow spaces between buildings there are wildflowers that stretch and preen… columbine, buttercup, lupinus, forget-me-nots… like little ecosystems that live just out of view of those who aren’t looking for them. I love to rediscover Barkerville’s tried and true buildings that are reassuringly, perfectly, exactly as they always are: the Bowron family parlour, the barber shop, the dentist’s office and the sacred stillness of our Chinatown’s Chee Kung Tong. Repeat visitors always remember their favourite displays and interpretive programs, and love that they remain just as they always have been in their memories and photos. Today, I feel like exploring one of the excellent themed museum displays our curatorial team has created in little pockets throughout Barkerville, so I pop into one of the Tregillus outbuildings. From the outside this appears to be your average log cabin-style shed, but inside the visitor is treated to several albums full of Tregillus photos (for decades, the Tregillus family was one of Barkerville’s most prominent and beloved clans). I flip through the picture books and play “spot the location” with the more Cariboo-specific photos. On a different day I might have chosen to go upstairs in the Nicol Hotel to visit another of my favourite places, the upper floor exhibit dedicated to the art and science of museology. I also love the Barkerville Hotel, wherein the curatorial team has turned each second-storey room into a tribute to a citizen who lived in the town during its most significant years. There are many of these themed displays throughout Barkerville, and new exhibits are in the works all the time. Soon my half hour is up and it’s time to move out of the shadows and back into the sunlight, ready to be photographed and to answer questions and engage visitors and play to the crowds of people who are here for their first time or their fiftieth time. Barkerville may be old, but it never gets old to me. 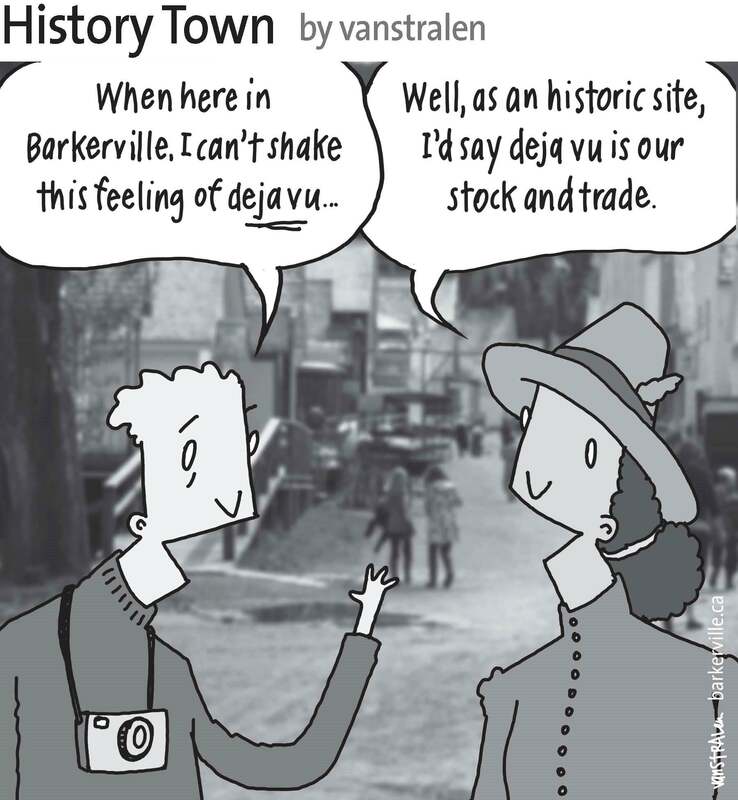 The above one-panel cartoon (originally published July 12, 2014) by Dirk Van Stralen, with accompanying editorial by Danette Boucher, is the ninth of twenty weekly entries that were logged – and subsequently blogged – as part of a 2014 collaboration between Barkerville, British Columbia and the Prince George Citizen aimed at introducing some of the quirkier advantages to living, working, and playing in the Cariboo Goldfields. We hope you enjoy!